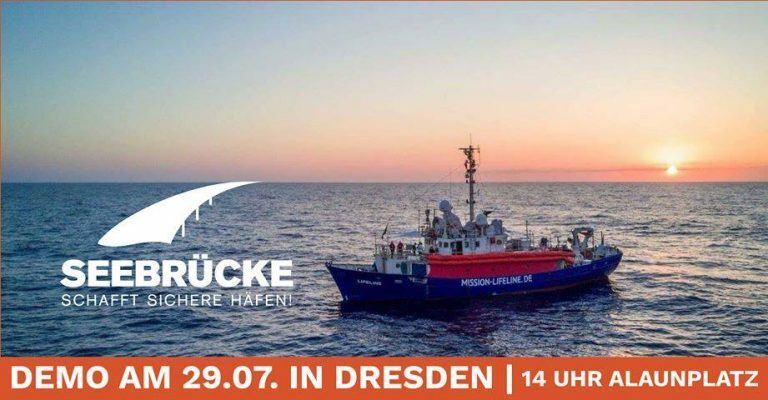 Call for Demonstration in Dresden: Sea bridge – create safe ports! Join the demonstration for a safe Mediterranean by sea rescue! For a humane policy and against the dream of the fortress Europe. The dream of all those right wingers, who want to seal off Europe completely. We want to walk through Dresden on Sunday, July 29th, demonstrating our conviction with all distinctness, accompanied by fine beats. In the last four years, more than 16,000 people drowned in the Mediterranean by trying to reach Europe’s shores according to UN’s numbers. But instead of expanding sea rescue and supporting private NGOs, EU and national governments go for blockade and criminalization. Now, the rhetoric is followed by action: rescue ships are not allowed to leave the ports anymore. By applying juridical tricks and open racism, rescue ships are restricted to the ports, the supporters are doomed to watch helplessly. Parallely, dreadful news reach us almost every day, reporting of ever new ship accidents with many people dead in the Mediterranean. We cannot keep watching at these inhumane events for just one more day! Letting people die with full consciousness is unbearable. It contradicts any contemporary understanding of human rights. We claim: humanity rather than the fortress Europe! Sea rescue rather than sea distress! Safe ports rather than sealing off nation states! Stand jointly for the sea bridge, stand for sea rescue! One of the ships that was prohibited from rescuing is the Lifeline. International media coverage of the ship rose up when hundreds of rescued people on board had to endure a whole odyssey. After days only, the completely exhausted crew was allowed to enter Malta’s port. Lifeline’s captain is facing criminal charges now, the ship has to remain in Malta. By this, the self-declared continent of humanity drives many people into their certain death. We are a broad network of people, initiatives and structures who do not want to keep watching. Support us and people in distress at sea! Join the demonstration, support sea bridge and pass on the message. On July 29th, Dresden lies at the shores of the Mediterranean. We count on you! This entry was posted in Allgemein, demonstartions and calls, events, news, practice, racism and tagged Asylum, border regime, capitalism, crisis, deportation, Dresden, flight, fortress europe, greece, Internationalist Center, Lesbos, open borders, political solidarity, racism, refugees, sea bridge, solidarity by . Bookmark the permalink.